Moist or dry. Peatlands, bogs, swamps, and dry uplands over bedrock or boulders. Shade tolerant. This is a small or mid-sized, moderately slow-growing, evergreen, coniferous tree. It rises on a single trunk from shallow, fibrous roots. In Minnesota, mature trees in bogs (acidic peatlands) are usually no more than 20′ tall and 2″ in diameter at breast height. In swamps (non-acidic peatlands), mature trees are usually 20′ to 30′ tall and up to 12″ in diameter. In dry uplands, mature trees can be up to 50′ tall and 18″ in diameter. Large individuals may be more than 60′ tall and 19″ in diameter. This is a moderately long-lived tree, often reaching 200 years in age. Stunted trees in acidic peatlands can survive up to 250 years. Most of the live roots are within the upper 8 inches of soil. As the tree gets larger, its weight causes it to sink into the peat. As the deepest roots become starved for oxygen and die, a new upper layer of live roots develops. The crown is thin and narrowly cone-shaped or spire-like and extends well down the tree. There is often a dense clump of short branches at the top of the crown. In crowded conditions, the lower branches die but remain on the tree. The trunk is straight and distinct to the top of the tree. The bark on young trees is thin, pale reddish-brown or grayish-brown, and finely shredded or broken into small, flaky scales. On mature trees the bark is gray, darker, and broken into thin, irregular scales. On older trees the bark is thicker. Newly exposed inner bark is olive green to yellowish-green. The branches are short and whorled, with each whorl representing one year of growth. The tree’s age can be determined by counting the number of whorls from the bottom up. Smaller branches develop between the whorls. Branches at the very top of the crown are ascending and dense. Upper and middle branches are horizontal or slightly drooping. Lower branches are strongly drooping with the tips turned upward. First year twigs are slender, yellowish-brown, and covered with many short, brownish hairs. They do not hang downward (droop). Second year twigs are brown with purple splotches at the leaf bases. The buds are egg-shaped, about ⅛″ long, and narrowly angled at the tip. They are covered with many overlapping scales. The needle-like leaves are bluish-green and are arranged in a tight spiral pattern around the twig. They spread in all directions from the twig. They are evergreen and remain on the tree 7 to 10 years. When crushed they emit a pungent odor that has been compared to cat’s urine. Each needle is 3 ⁄16″ to 9 ⁄16″long and 1 ⁄32″ to 1 ⁄16″ wide. It is borne singly on a peg-like base that persists after the needle is shed. It is stiff, straight or slightly curved, 4-angled, and square in cross section. It rolls smoothly between the thumb and forefinger. It is blunt or broadly angled at the tip. There are two whitish lines of minute openings (stomata) on each surface, but those on the lower surface are more prominent. Each whitish dot (stomate) is a pore surrounded by two glaucous guard cells. The guard cells control the size of the opening, allowing the exchange of gasses and water vapor. Male and female cones are borne on the same tree. New cones are produced every year. Pollen (male) cones appear mostly in the lower half of the crown, always below the female zone of the female cones. They are borne at the end of or along the sides of one year old (second-year) twigs. They are red and succulent when they first emerge. Mature cones are dry, yellow to light brown, oblong to almost globe-shaped, and ⅜″ to ⅝″ long. They shed pollen in early May to mid-June then turn yellowish-brown. Seed (female) cones appear in the upper 3′ to 4′ of the crown. They are borne on leaf axils or at the tip of one year old (second-year) twigs. They are green at first. As the cone becomes receptive the scales turn purple to green and the cone becomes erect. At the time of pollination the cones are ⅝″ to 1″ long and the scales are widely spread. They reach maturity by late August or early September. Mature cones are brown, egg-shaped to almost round, ⅝″ to 1¼″ long, and hang downward. The scales are fan-shaped, widest near the tip, light brown, thin, and flexible. The scale margins are irregularly toothed. Seed cones open gradually over many years. They remain on the tree and continue shedding seeds for up to 25 years. 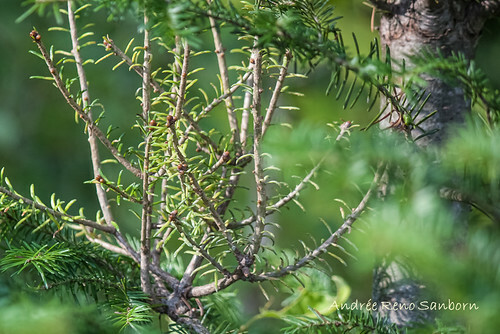 Balsam fir (Abies balsamea var. balsamea) has a narrowly pyramidal crown. The bark is not scaly but smooth except for raised resin blisters. The needles are longer and are attached flush with the twig. They are flattened in cross section, and do not roll easily between the thumb and forefinger. On lower branches they are often twisted at the base causing them to appear two ranked. Mature seed cones are much longer, 1¼″ to 3⅛″ long. White spruce (Picea glauca) crown is dense, relatively uniform, and cone-shaped. The middle and lower slightly drooping. The twigs are hairless. The needles are longer and sharply pointed. Mature seed cones are longer, up to 2⅜″ long. Dwarf mistletoe (Arceuthobium pusillum) is a parasitic plant that causes the tree to form a dense cluster of twigs called witch’s broom. It draws nutrients from the host tree, reducing the host’s growth and eventually killing it. There are two co-champion black spruce trees in Minnesota. One is on state property in or near Ash River, in St. Louis County. In 2017 it was measured at 85′ tall and 53″ in circumference (16⅞″ in diameter). The other is on state property in or near Big Falls, in Koochiching County. In 2015 it was measured at 84′ tall and 52″ in circumference (16½″ in diameter). 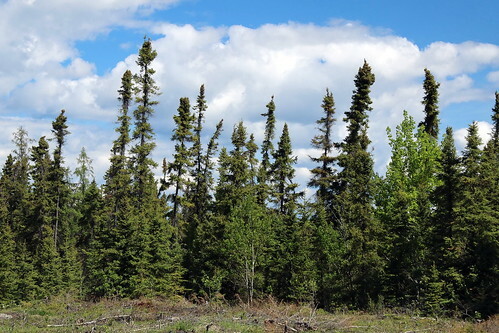 Black spruce are small trees found in interior Alaska. They are found in areas where permafrost is present, and grow slowly, so trees that appear small may be over 100 years old. Learn more about monitoring efforts associated black spruce forests and other arctic land features at http://science.nature.nps.gov/im/units/arcn/index.cfm?rq=12&vsid=28. Learn more about black spruce and fire at http://www.nps.gov/akso/nature/fire/science.cfm. Don Leopold demonstrates the characteristics of black spruce. Content produced by Christopher Baycura for the SUNY College of Environmental Science and Forestry (SUNY-ESF). Rodney Brown performing a song written by Ian Tamblyn from his CD North Land. The video by UK film maker Martin Ellerbeck was shot in the wilds of Northwestern Ontario.